gets soft when you leave it next to a window for too long. while visions of sugarplums dance in its head. or really your heart, i guess. the twinkly lights don't matter. but they don't make christmas christmas. and it's okay if it doesn't. some years are just that way. 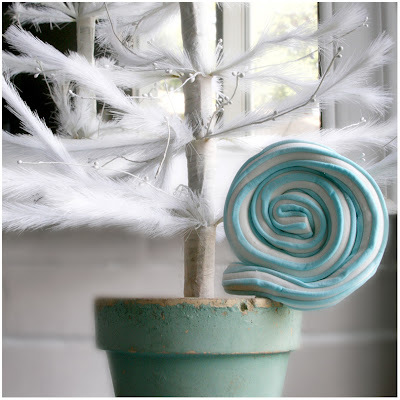 love the photo, it looks like a Whoville lollipop! bestest lollipop i ever did see! and my god, how is it you are always surrounded by your signature color? Gosh, that lolly makes me smile!! It's true~the season happens no matter how we're feeling, & maybe if we can just go along with that (on years when we're not so jolly) it will all be ok. I really loved this post.you take gorgeous photos and have inspiring thoughts. Seasons come and seasons go, take a deep breath, just enjoy no matter if the decorations are up or not. Love your picture. oh my gosh I love your tree and the lollipop is just ever so lovely I do looooove that colour. I am sort of struggling a bit with the "christmas spirit" this year though I know it will be Christmas anyway. Loving these advent posts. i hate to panic over holidays. you are so right, they come anyway and we are ready in some fashion. family will be fed, hugged, and remembered. Debi, I had to say goodbye to my darling Max last night and I came home and read your various posts about Maggie (and Lily) because I knew how much they would help, and then I read this post about it being okay not to be feeling the Christmas spirit because right now, all I feel is sadness and loss but also gratitude and I wanted to thank you for all of your words, they touch my heart in so many ways every day. thank you thank you for the blue .. your special shade of blue and white is like a soft breeze .. I think, officially today, the busy has subsided. It's been an epic journey, let me tell you, but now....all is quiet. I have this one precious quiet day before I am surrounded with people and activity. I am savouring it, just as that squishy lolipop is soaking up the light.